Breon O'Casey - Paintings, Sculpture, Printmaking, Jewellery & Textiles. Somerville College, Oxford – solo. 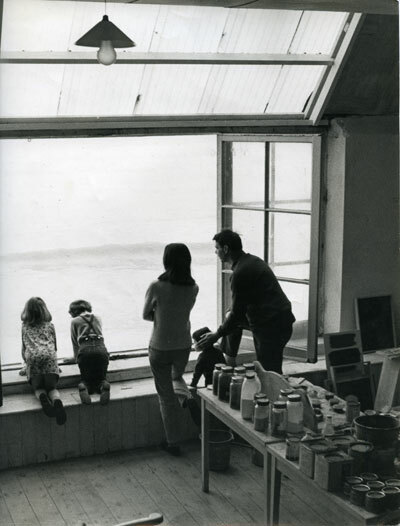 Penwith Society of Arts, St Ives – group. Signals Gallery, London – group. Marjorie Parr Gallery, London – solo. British Crafts Centre, London – group. Park Square Gallery, Leeds – solo. Brown Thomas Gallery, Dublin – solo. Oxford Gallery, Oxford – with Bryan Illsley. Bath Festival Gallery, Bath – group. Arnolfini Gallery, Bristol – with Bryan Illsley. The Goldsmith’s Hall, London – group. Craftworks, Guildford – with Bryan Illsley. British Crafts Centre, London – solo. Craftwork Gallery, London – with Bryan Illsley. Chastinet Gallery, London – solo. Oxford Gallery, London – solo. O’Casey Craft Gallery, London – solo. Prescote Gallery, Banbury – solo. Kruger Gallery, New York – solo. Fulham Gallery, London – solo. Helen Drutt Gallery, Philadelphia – solo. Oxford Gallery, Oxford – solo. Victoria and Albert Museum Craft Shop, London – group. Ingrid Presser, Germany – solo. Taylor Galleries, Dublin – solo. Crafts Council, London – group (touring exhibition). Oxford Gallery, Oxford – with David Garland. Rufford Crafts Centre – group. Collier Campbell Gallery, London – solo. Narrow Water Gallery, Northern Ireland – with Carolyn Mulholland. Korim Kiele, Helsinki – group. Wolf at the Door, Penzance – solo. Taylor Galleries, Dublin – with Conor Fallen. Little Rock, Arkansaw – group. Schmuck Unsere Zeif, Zurich – group. Cornwall Crafts Association, Trelowarren – solo. New Ashgate Gallery, Farnham – group. Oxford Gallery, Oxford – group. St James’s Gallery, Bath – solo. Black Swan Guild, Frome: Man and Materials – solo (touring exhibition). TristAnn’s Gallery, Dundalk, Ireland – solo. Lynne Strover Gallery, Cambridge – solo. Bridge Gallery, Dublin: The Irish Friends of Denis Mitchell – group. Brewery Arts, Cirencester – solo. Contemporary Applied Arts, London – group. The Society of Arts and Crafts – group. Berkeley Square Gallery, London – group. 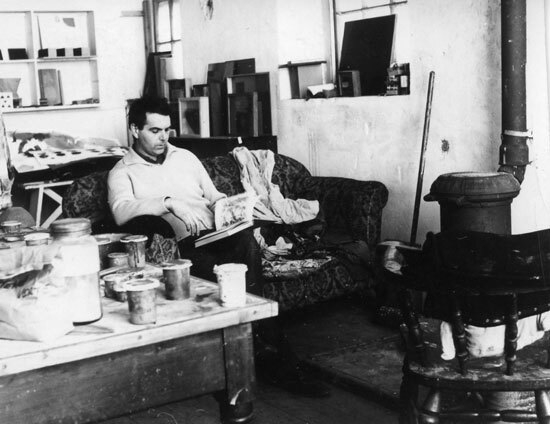 Tate Gallery, St Ives – with Bernard Leach. 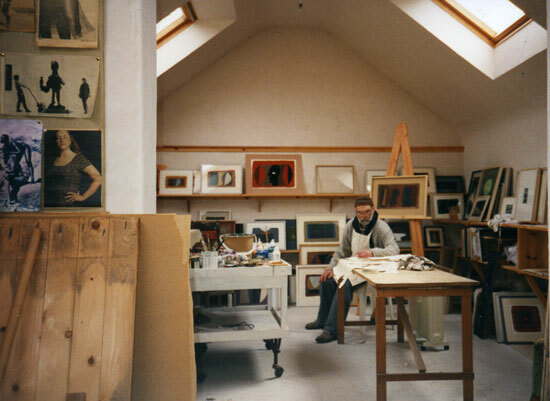 Royal Hibernian Academy, Dublin – solo. Scolar Fine Art, London – solo. 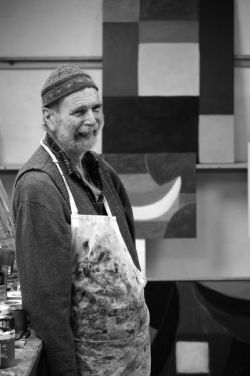 Lynne Strover Gallery, Cambridge – with Jim Partridge. New Ashgate Gallery, Farnham, Surrey – solo. Peppercanister Gallery, Dublin – solo. Wexler Gallery, Philadelphia – solo. 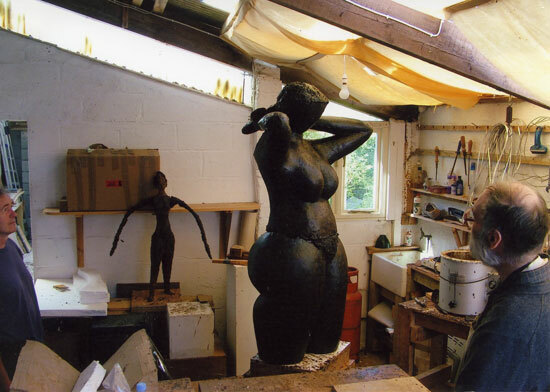 Yew Tree Gallery, Morvah, Cornwall – solo. Mullan Gallery, Belfast – solo. The Stour Gallery, Shipston-on-Stour – mixed. Six Chapel Row, Bath – solo. Yorkshire Sculpture Park – solo. Lemon Street Gallery – solo. Yew Tree Gallery, Morvah, Cornwall. Lemon Street Gallery at Dundas Street Gallery, Edinburgh – group. Lemon Street Gallery – group. Arts Council of Ireland / An Chomhairle Ealaion. Farmleigh House – Office of Public Works, Ireland. Kunstsammlungen Der Vests, Coburg, Germany. Leeds Museum and Art Gallery. Museum of Fine Arts, Houston. Plymouth Museum and Art Gallery. Royal Museum of Scotland, Edinburgh. Worshipful Company of Goldsmiths, London. Here is my story. I was born in London in 1928. My parents were Sean O’Casey, the Irish playwright, and Eileen O’Casey, an actress. My mother’s people came from Mayo; my father’s from Dublin. In 1937 the family moved from London to Totnes in Devon, partly because Dartington Hall, which was nearby, provided a sensible school for their children. The school was a success and I benefitted greatly from my time there. 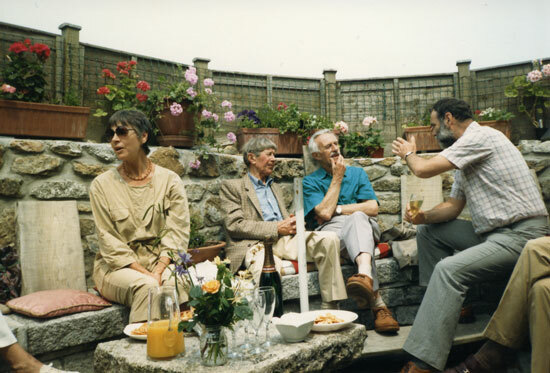 Dartington was founded by Leonard and Dorothy Elmhirst, who had a vision of a Utopian community which combined the working of the land with the life of the spirit through the arts. The emphasis the school placed on physical activities and skills, considering them equally important to academic skills, was crucial to me. It was at Dartington School that I learnt to saw and hammer: to think with my hands as well as my head. 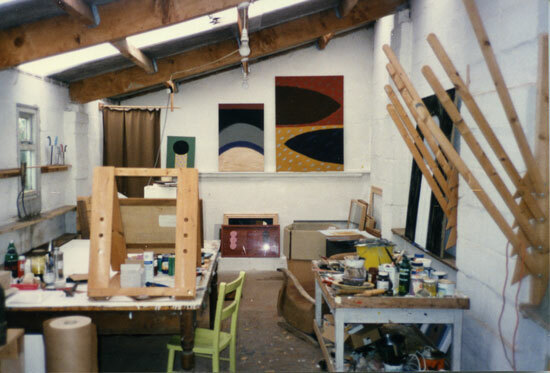 Because of the way teaching at Dartington was structured, and although there were periods set aside for art, the art room was available at any time. People did sit the art exam, learning the history of art, and drawing a sprig of ivy. But I never did: I took art too seriously to ever sit an exam, nor ever have. 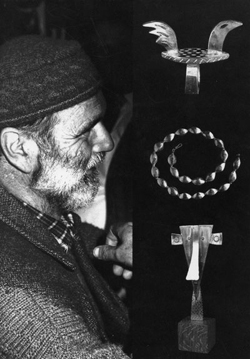 I was taught metalwork at Dartington by Naum Slutsky. Before the war Naum had been head of metalwork at the Bauhaus, but owing to Hitler, he had ended up teaching us kids. Naum was a short, dark haired man with massive shoulders, impeccably turned out and rode around the estate on a huge jet black stallion. In one of his classes, we drilled holes in a small sheet of german silver and were told to saw a design at random. This was to teach us to use the piercing saw. And this was my first piece of jewellery. Entry to his special metal class was a “square inch of mild steel”: he cut the end off a square bar of steel which was just proud of an inch. Your task was to file it down until each side was exactly an inch square and each angle was exactly a right angle. This was, of course, impossible; but if you nevertheless stuck at it for a number of sessions (3, I think) he let you in. I was lucky in that, after my National Service, few people wanted to go to Art School. Fewer still wanted to go to the Anglo-French Art Centre, a small hard-up school in St John’s Wood, with close links to the French school of painting, which greeted me and my grant with open arms. Today, with the qualifications I had then (nil), I would never have been able to get near an Art School. At Art School we learned from each other, and from endlessly parading around the London art galleries, both private and municipal. After leaving, the next ten years were spent in the wilderness: perhaps a necessary process in the development of an artist, but a deeply depressing time, full of doubt and lethargy: dark years. One day, watching television, sometime in the late fifties, I saw a film about Alfred Wallis, a primitive painter who had lived at St Ives in Cornwall. The film showed St Ives and the studios of some of the artists living there. I realised it was the place for me. Ah St Ives! In those days still a working fishing port, with tourism and art only tolerated, but kindly tolerated. The relief of mingling with other crazy artists was enormous. It was literally as if a great weight was lifted from my shoulders. This is exactly how it felt. One must remember the strong antagonism to modern art then, and the nervous energy used up resisting it. One was with a group of people who were hoping to make a living from their art and indeed some were professional artists. That times were hard mattered little. If no one has much money it doesn’t matter. And I certainly never experienced the depths of poverty and the necessary determination to survive it, that my father had experienced. Nor indeed did I face the privations that, as one reads, Matisse faced, never mind those suffered by the true early warriors, Van Gogh and Gauguin. My studio was in a ramshackle, wooden structure tucked in behind other similar studios facing out over Porthmeor beach to the wide Atlantic. I slept in a curtained off alcove at one end - illegally- and in the winter the thud of the great waves would shake the whole crazy structure like a dog shaking a rat. It was kept standing by the law of inertia which says: if an object has been in one place for a number of years, it will resist, of itself, natural physical forces trying to move it. I got to know the sculptor Denis Mitchell, and he hired me as a part-time assistant, his first; and I worked for him for about two years. 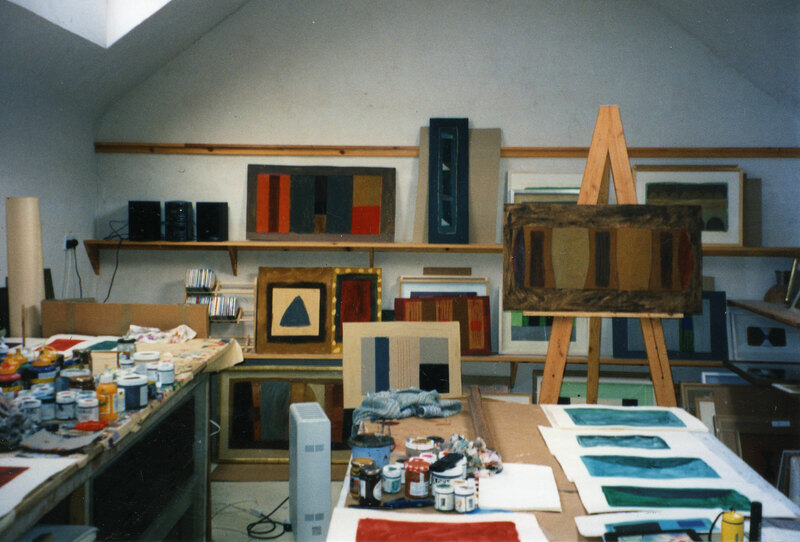 In those days, his studio was a cluttered ship-like loft above a yard, just off Fore Street, and consequently a convenient port of call for artists out for air. It was here that I met for the first time artists that had only been names to me before, and to find out to my surprise that they all had feet of clay (some of them had heads of clay too). It was here that all the gossip gathered, all the comings and goings of the Penwith Society, all the news from London. The studio was very untidy. We spent a great deal of time searching for mislaid tools. My contribution to tidiness was to put up a notice saying “Don’t put it down, put it back”, which did no good at all. And yet the work got done. I worked mainly on the bronzes, filing and plugging. Denis’s method of work, getting his plaster patterns sand cast before working on them, is as close to carving bronze as you can get. Bringing out of this roughly cast lump of metal an elegant shape, was heartbreakingly tedious work. He had very few power tools, and was reluctant to use even those, so it was down through the files, then down through the emery papers, ending up rubbing the bronze with bits of torn off cigarette packets soaked in Brasso. And so I learned and so he taught through practice, the passion of getting it just right, step by patient step, at whatever the cost. I learned to accept the tedium of work; the practical way to Heaven, using hammers and saws, ropes and pulleys, chisels and files, among the dust, filings and shavings of the cold, dark, damp workshops, that now I love so much. 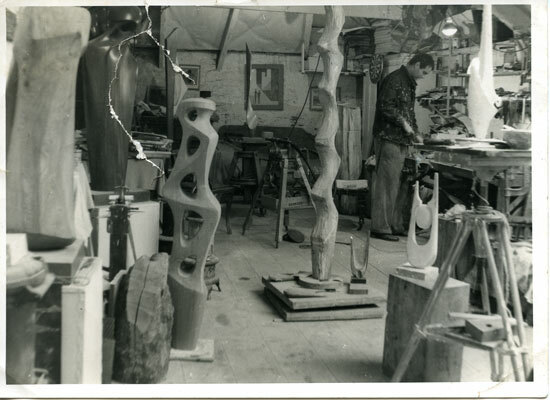 I first went to work for Barbara Hepworth on a temporary basis in the late 1950s. I was to help out for a week, and stayed three years. This was nothing unusual. Barbara’s method of hiring people was very sound and one that I have copied: she would ask the person to help out for a week, and, if they were no good, at the end of the week she would thank them and see them off; but if she liked them, they would stay on perhaps for a month, and that month would stretch to as many years as was mutually agreeable. 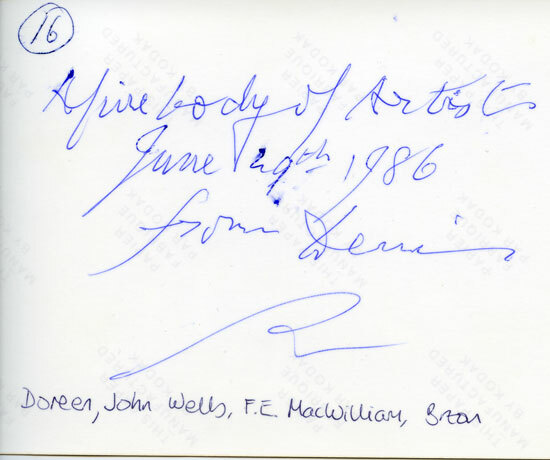 It was my first intimate acquaintance with a famous artist. She paid me £2 a day and I worked for her three days a week. I never have (and never will) worked full-time for anyone – I have always, even when we were hard up, kept some time for my own work. We started work at 8 o’clock, and if you were late, nothing was said, but she would keep pointedly glancing at her wrist watch – a black wrist watch on a black leather band- whereas at five to five there was invariably a sculpture to move…one seldom left on the stroke of five…this was a continual grouse. Barbara’s studio was in the middle of the town, in what looked from the outside, to be a fortress. Her workshops and garden were enclosed by a very high granite wall, leaning in places, very dangerously, over the narrow street. And it was a ritual, after an evening at the pub on the way home, to pee against this wall to further undermine the foundations. 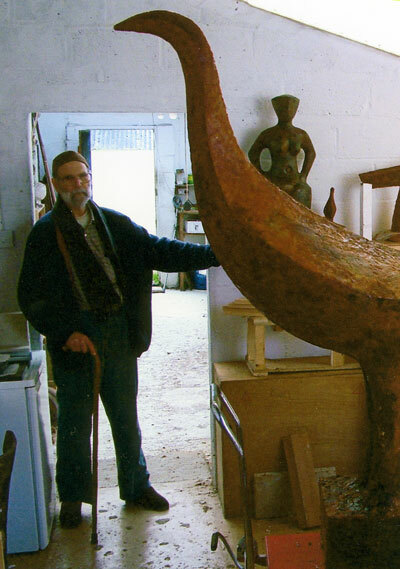 Working for these two sculptors was my apprenticeship. No nonsense about expressing yourself – you did what you were told. While on duty you thought Mitchell or Hepworth thoughts. Although I respected Barbara’s work, I didn’t have sympathy with it as I did with Denis’s, but even so those years working for Denis and then Barbara were a great education. How much you learned without really realising it: how to combine the practical world of the market place with the ideal world of the artist. I am an abstract painter, closer, in my work, to the older definition of a still-life painter than a landscape painter. A painter, that is, who works best in the confines of his studio, and who sees the world through a collection of pots and pans, apples and oranges (or circles, triangles and squares) rather than the fields, trees and skies. To look outside at the vast vista of unending landscape flowing in all directions, is for me too difficult to try and get down on paper. I shut the door and work in my windowless studio. From my garden I can see the church tower of St Paul de Leon and the surrounding trees rising above the village of Paul: straight lines and curves. In the garden is the Tai Haku cherry tree; in the Spring a mass of white blossom tinged with pale green and pink, in the summer a pattern of sturdy green leaves, in the autumn, as the leaves turn yellow and then deep red, the whole garden is filled with a burnished golden light. Where is the need to look further? Look closely at the grim, granite walls of the house, and they are a feast of myriad colours – delicate pinks and ochre’s, a thousand different greys. In the summer the dragonflies’ sharp metallic colours against the deep green of the hedges. The incredible hue of the magpie’s wing, which is not black but blue. The harsh Burnt Sienna red of the glimpsed fox under the umber ploughed field. The black and white cat with pale green eyes and pink nose, crossing the emerald green lawn. Ben Nicholson’s blackbird with a yellow beak in the holly bush; and in the winter the violets and purples of the bare trees against the grey Cornish skies. I paint in a studio with no windows. I was intrigued to read that Bonnard, when he painted flowers, had the flowers in the room next door, and would walk in and out to look at them: to have them in the same room would be too overpowering. I don’t know whether this is true but it is the way I work. The world is outside the studio observed, but once in the studio with the door shut, a painting is a painting, not a copy of a bit of that world. It is very difficult to talk about painting: it is after all another language. When I was a small boy I spent many weeks in my art class painting a picture of Red Indians galloping round a stockade defended by cowboys. I took infinite pains. Then, to finish it off, I painted these black diagonal dashes all over it. The teacher was surprised, “Why did you do that?” he asked. He thought I had ruined it. I knew but I didn’t have the words to tell him. I still don’t have the words. It started with a book brought out by the American government, one of a series to help ex-GIs to resettle after the war. This one was called How To Make Jewellery. It was well written, but the examples, as is so often the case with this type of book, were not very inspiring. At the back, however, were some vague photos of jewellery made by an Alexander Calder, which I liked. I knew nothing of Calder then, but over the years he was to become one of the artists from whose work I learned the most. Any aspiring jeweller has only to study Calder’s jewellery to be set on the right path for life. 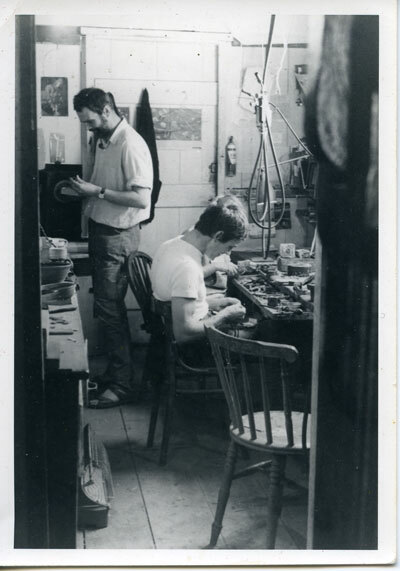 In the early days in St Ives, several of us, made odd pieces of jewellery to make some extra money, and sold it in Robin Nance’s craft shop on the quay. I found the demand and the time I spent making it, growing. I had worked as an assistant for both Denis Mitchell and Barbara Hepworth, and was also working evenings and weekends as a telephonist. The jewellery allowed me to give up all these jobs, and still have time for painting. And I gradually made a name for myself as a jeweller. After a year or so on my own, I hired Bryan Illsley to come and help over a busy Christmas. We got on so I offered him a partnership. He had been working as a packer at the Leach pottery, and Janet Leach had noticed that the best of the students’ pots were coming out of the packing shed; unbeknownst to me she had offered him a job as a potter. He decided however to come in with me, and we worked together for ten years or so, two days a week, the rest of the time left free to do our other work. Bryan and I, assisted by Stella Benjamin, were together for a team for many years before, for practical reasons, we’d both moved out of St Ives, and partly because it was time, we divided amicably both secretly relieved. And so I went on until I found the making of jewellery less congenial and more of a drudge. It was time to give up altogether. I came to weave, as with jewellery, from a book. I borrowed a book on Navajo weaving from St Ives library. I made a loom from an old bed and made a rug. In the process I think I made every mistake a weaver can. To see a rug grow so slowly, from thread after thread, was one of the greatest delights of my life! I loved weaving. If my legs allowed me, I would be working away still. It is the most delightful of occupations – why is it not taught at schools? Each rug is guaranteed to make you despair at least once, to curse the lack of exact colour you want, to make do with what you have, to turn water into wine. It has helped me with my painting. Painting is so quick. To decide to put a red line across a painting, and it’s done, and then what. To put a red line across a rug takes the best part of a morning and during that time the next step is clear. Rugs are intended to be used. So I hope my rugs will start life in the place of honour, in front of the living room fire, be taken later to the spare room, old and threadbare, or rolled up to stop the draught under the back door, and eventually folded up in the outhouse for the cat to sleep on. I had made several attempts at sculpture in the past, after all I had spent many years working for sculptors, but to no avail. I couldn’t seem to think in 3D, but I came to it eventually through the back door. I had made a number of animal brooches, and these evolved into little silver animals in their own right. 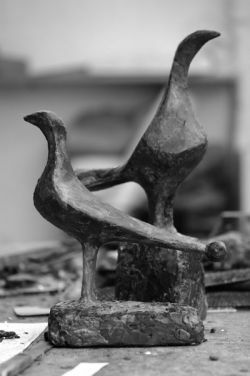 Conor Fallon, the Irish sculptor, introduced me to wax as a material, which I found more sympathetic than clay or plaster, and I began to make small wax figures and getting them cast in bronze. And these grew in size. So sculpture took the place of weaving and jewellery as the antidote to painting. At first as a sideline, a relief from the anxieties of paint. But gradually it has taken on a more important role and I can say now that it is at least as important to me as painting and I devote an equal amount of time and thought to it. It’s odd, but although my paintings are almost always abstract, my sculptures are almost always of some animal, bird or person. Why this is, I am not sure (nor do I care.) It’s as well to let questions like that alone. I don’t think you can apply texture to a sculpture, Barbara started to do that and, for me, it didn’t work. Moore never did it. It is the same with my jewellery. It is the tool which gives the texture, not me. And that gives the character which only a hand-crafted piece has. I have been lucky in those I have worked for and those who have worked for me. Denis Mitchell remained a true friend until death. Barbara, no, but her foreman, Dicon Nance, a superb craftsman, patient and kindly, taught all of us, and helped me out of no end of scrapes. 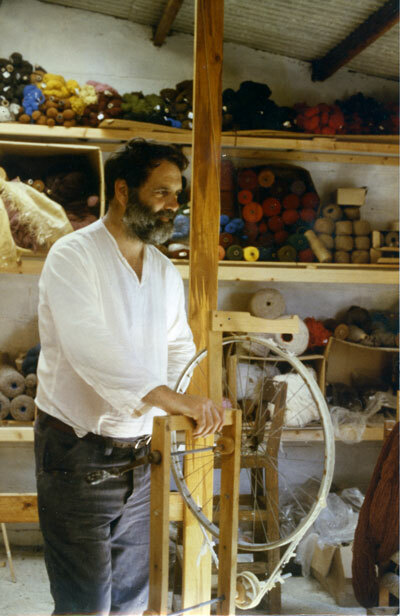 I sat beside Bryan Illsley for ten years and we never came to blows – quite an achievment for both of us…then there was the gentle Stella Benjamin, who also came to help me with the weaving, becoming a far, far better weaver than her teacher. As for the other weavers there was Sue Marshall, who should have employed me rather than the other way round, Jane Row, Charlotte Gunn, and others, who dropped in like migrating birds, making one quicken one’s step on the way to the weaving shed or jewellery workshop. And now there’s Guy Royle whose sense and sensibility helps keep the creaking old machine going. What luck. You see before you, in these magnificent robes, a failure. A failure in the sense that I was seventy before I was able to give up all other means of earning a living and devote myself entirely to painting and sculpture. And I am not the only one. Ben Nicholson, no less, was sixty-four before he could afford anything but a second- hand car – and he was very fond of cars. You may be a Damian Hirst (you may win the lottery), but I am afraid you are far more likely to end up like me – having to find other ways of earning a living for most of your lives. You are destined, particularly if you are good, to end up as big a failure as me. You must remember that while you were here it was the job of the staff to take an interest in what you were doing: it was what they were paid for. Once you leave here, nobody gives a damn and, as Bernard Shaw said to my father: “You’ll just have to go through the mill like the rest of us.” And believe me, that mill grinds exceedingly small. Good luck! That there is nothing new under the sun, but an infinity of arrangements. This website and all text and images contained within it are copyright to the estate of Breon O'Casey unless otherwise stated. Any infringement of copyright will be vigorously pursued.